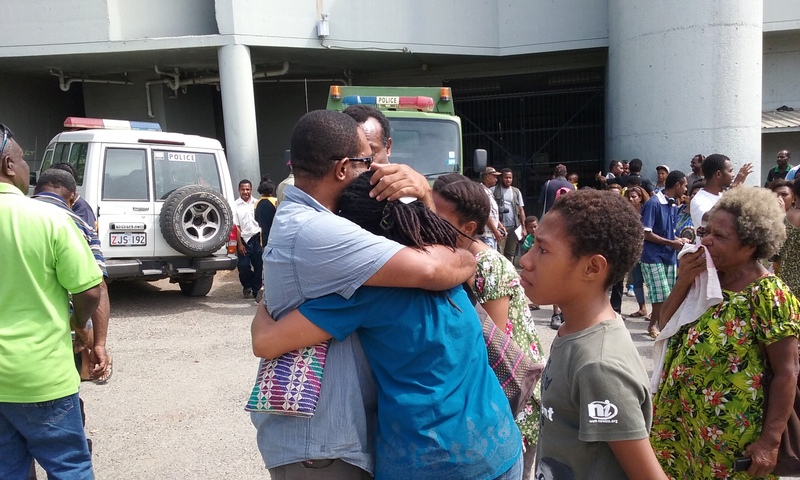 Families of the 12 PNG Defense Force Soldiers who spent more than months five incarcerated at the Bomana Correctional Facility on Saturday reunited with their loved ones. The Military court put all 12 on a two years good behavior bond after it was of the view that a further custody would not be appropriate as the Government and PNGDF failed to sustain their operation in Moro. The court suspended all their imprisonment terms ranging from three years to a year. It was an emotional reunion for many of the wives of the soldiers and their children who had to find other means to survive after their husbands and fathers were put off the payroll. Commanding officer Major Benjamin Edimani thanked the families for the prayers and faith in God during this difficult time. “We were lucky to have our wives and families and children who were very supportive. This ordeal would leave to a lot of wives leaving their husbands, I would like to thank all who prayed and supported us all this way. “At some stage we had the confidence in the court that the case would come to an end so we thank the court for having the confidence in us,” Major Edimani added. They were convicted in June this year for Mutiny, for their part in disobeying directions from the PNGDF Headquarters to cease an operation in Komo, Hela Province and return to Port Moresby after funds had run out during their two year operation.